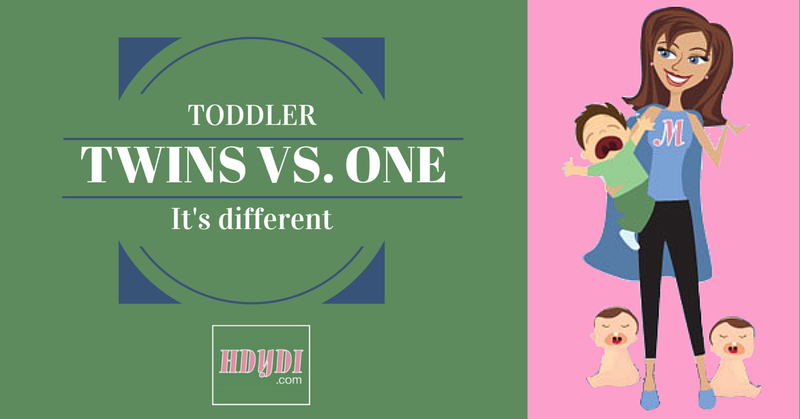 Toddler Thursday: Two vs. One | How Do You Do It? It’s 8:00 and Oliver, my 4 year old, is due at school at 9:30. I still have to get myself, Oliver, and my 19 month old twins dressed. I’m already feeling frazzled and I’ve only been awake 30 minutes. So far I’ve fed all five kids and have kissed my older two boys goodbye as they left for school with their dad. I meant to wake up earlier so I could get myself ready in peace, but Rhodes slept with us last night and kicked and squirmed so much I didn’t sleep well. When my alarm went off I opted for 30 more minutes of sleep. 8:05 I’m standing at my sink brushing my teeth while Oliver is taking a shower. Laurel has toddled into the bedroom and is rummaging through my night stand. Rhodes is standing at my feet whining to be picked up. 8:07 Oliver has gotten soap in this eyes and is screaming. Rhodes is still whining and Laurel comes back from the bedroom covered in cuticle oil. 8:08 I grab Laurel and put her into the shower with Oliver. I’m rinsing Oliver’s face and hair when Rhodes’ whining escalates into crying. I glance at him to find he’s hit himself in the mouth with my hairbrush and has a bloody lip. 8:09 After a quick cuddle I put Rhodes in the shower too and cross my fingers that it will clean off the blood and keep him entertained long enough that I can get dressed. It’s at this point I’ve realized the extra 30 minutes of sleep weren’t worth it. 8:10 I’m in my closet trying to squeeze into a pair of jeans that I swear fit last week (Darn Easter candy). I make them work and throw on a blousy shirt in hopes of hiding the muffin top my now too tight jeans have caused. I do some lunges on my way out of the closet. Yay! Multitasking! I’m exercising and stretching my jeans! 8:11 All three kids are playing so I take the opportunity to throw on my makeup. I realize that Rhodes has chewed on all my makeup brushes and they are wet and gross. I use my fingers to apply eye makeup and blush. 8:13 My hair is too dirty to pull back but there is no time to wash it. I briefly toy with the idea of using one of Laurel’s head bands to hide my roots and greasy part. I decide I’m too old for that and use a bobby pin to pull just my bangs back. 8:14 The water has gotten cold so all three kids are fussing to get out. 8:15 While I’m getting Laurel out and dried off Oliver escapes and runs thru the house soaking wet. 8:17 Both twins are dry and as I’m walking them to their room to get them dressed I slip in a puddle of water. My bottom hurts and the twins are crying because I yelped when I fell. 8:18 We make it to the twins room and Oliver joins us. He’s still naked and is fussing because he wants to play on his older brother’s Itouch. I try to ignore him while I’m picking out clothes. 8:20 Rhodes and Oliver are now dressed but Laurel is nowhere to be found. 8:21 I find Laurel in the utility room eating dog food. 8:22 Laurel is throwing a fit because I’ve disturbed her second breakfast and Oliver is still whining. Rhodes is pushing cars around the playroom. 8:24 I’ve given in to Oliver and allowed him to play with the iPod Touch. Laurel is dressed but now Rhodes is crying about another bloody lip. He was crawling too fast, fell on his face, and bumped his lip on the car he was pushing. 8:26 Rhodes is calm. Oliver is calm. Laurel has once again disappeared. 8:27 I find Laurel in the bathroom where she is happily shredding toilet paper. I decide the mess is worth the peace and go looking for our shoes. 8:30 Victory! Everyone but Oliver has on shoes. He is pouting because I can’t find his Buzz Light Year socks. 8:33 Negotiations are complete. I’ve convinced Oliver to wear plain socks in exchange for allowing him to play with the Itouch in the car on the way to school. 8:34 The twins are gone. The house is quiet. This. Is. Bad. 8:35 I find them both outside. They have crawled through the pet door and are splashing in the bird bath. 8:40 I have wrestled the twins into new clothes. I’m sweating and grouchy. If I hurry I can make a cup of coffee to take with me. 8:42 I put all three kids in front of Curious George and head to the pantry. 8:43 Oliver is screaming because the Itouch’s battery is dead. Rhodes is screaming because Oliver is screaming. Laurel is in the pantry looking for cookies. 8:44 I’m charging the Itouch and holding Rhodes. Laurel has decided a cereal bar will work since we have no cookies. She has squished it while bringing it to me so when I open the package the bar crumbles to the floor. 8:45 Laurel is on the floor rolling around in cereal bar crumbs crying for cookies. I decide to not change her out of the sticky, crumb covered clothes. 8:47 I’m now holding Laurel and Rhodes and trying to put a coffee pod into my Kureig using my teeth. The twins explode into giggles. 8:50 Coffee’s made and we are on the way to the car. Everyone is happy! 8:51 I drop my bag and as I bend over to get it I spill coffee all over my shirt. I briefly contemplate sucking it out of the fabric. 8:53 Oliver is buckled into his seat. The twins have decided it’s time to ride bikes and are fighting over a ride on toy. Rhodes pushes Laurel and she is MAD. I scoop her up just as she’s lunging to bite him. 8:56 The twins are buckled into their seats but are not happy about it. Laurel is screaming for cookies and Rhodes is screaming because he can. 8:58 Silence. Everyone is watching the video and we are finally on our way. I’m sure many of you a shaking your heads and smiling because you have been there. You know how it feels to run from one problem to the next all while trying to keep the day moving and actually be productive. There is a constant battle between independence and needing/wanting to be cared for. It’s hard for them to decide what stance they want to take in any given situation and it’s even harder for parents to read what their child wants. What’s ok one day just might not be the next. You will witness wonderful creativity. I’m always amazed how toddlers can turn anything into a toy or game. I watched Rhodes play this afternoon with a cup, bowl of water, and a rock for over 30 minutes. Never underestimate their ability to entertain themselves without toys or technology. 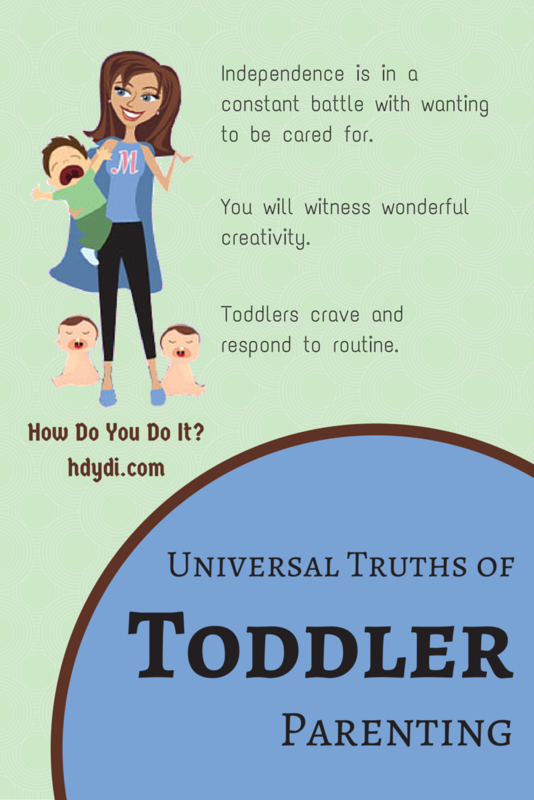 Toddlers crave and respond to routine. The need for a schedule doesn’t stop at the end of infancy. Knowing what to expect and what’s coming next is reassuring to children of this age. I find when I stick to our routine that tantrums are greatly diminished. Parenting toddler multiples is very different. I was naïve and really celebrated when my twins turned one. I remember telling a friend “They are sleeping through the night, nursing is done, and they are learning to walk and talk. Things are bound to get easier now.” So far that hasn’t happened. Here are the ways I find parenting toddler multiples different than singletons: Whether you admit it or not you are always comparing them. When I was parenting my singleton toddlers comparisons usually happened at playgroups or in online forums. The anxiety of “Why aren’t they____?” was usually confined to that situation or to the few moments I’d spend replaying my day. Now I find myself not only constantly comparing them, but also trying to compensate for imaginary weaknesses. For example Laurel’s language is very advanced. Her adjusted age is only 17 months and she’s already stringing together words to make sentences. Rhodes isn’t doing this. He knows several words, but isn’t close to speaking in sentences. His speech is exactly where it should be for his adjusted age, but I find myself grabbing a book and pulling him into my lap more often than I do Laurel. I’m constantly repeating his gibberish back to him correctly and engaging him in songs. None of this is done intentionally and I know I’m intuitively trying to encourage his language development because his sister’s is so advanced. If he was a singleton the poor kid wouldn’t be subjected to my constant singing and chattering. Everything is more. The noise, the mess, the laundry, the… you get the point. Laurel is a screecher and Rhodes is a yeller. Happy, sad, mad, all require screeching and yelling. My house regularly sounds like a pet store. Double the toddlers means the playroom regularly looks like tornado hit it. Unfortunately both twins are “dumpers”. They love nothing more than to walk up to a basket of toys and dump it out. They don’t do this to look for a specific item. They just enjoy pouring all the toys. When you have one child that screeches or pours toys it’s annoying. When you have two a bad day can bring you to your knees. Outings require pickiness. I have a friend whom I love dearly but I will not bring the twins to her house. She has an elderly grouchy dog, a very tall slide, and a sunken living room. With one toddler I could manage all these variables by keeping the child in my line of sight. With two toddlers who are inevitably drawn to different areas I just can’t do it. I’ve also run into this when choosing parks and restaurants with out door seating (is it fenced?). Any place I’m going to have to follow them around in order for them to be safe is out. Confinement is necessary. My morning adventures would have been much easier if I could have gotten us ready to go out from our playroom. We have put a lot of time and effort into making it a room that is comfortable for adults as well as fun and safe for the twins. There is really nothing they can do to hurt themselves while playing in it. The furniture is bolted to the walls, all outlets are covered, the floor is soft, and most importantly they can’t go in separate directions. It’s so nice to have a place where we can spend time and the twins will be safe without me needing to be in two places at once. You can’t mess with naps. When my singletons were toddlers there were times when I’d force them to make do with a nap in the car or go without one altogether. I’d pack lots of snacks and expect to have to keep them really busy. Most of the time this would work and we’d get to enjoy whatever event was happening during their nap time. Unless it’s a once in a lifetime event or an emergency I won’t do this with the twins. Not much is worth the risk of potentially having two tantruming toddlers. Toddler relationships Children of this age generally don’t play together. They usually engage in parallel play (side by side) or spectator play (observing and mimicking). Very rarely will two toddlers actually interact during the same activity. Laurel and Rhodes play together. They will roll balls or cars together or look at the same book and chatter to one another about it. It’s amazing and adorable. I have to say that this is my favorite part of this stage. I love watching them interact. This season of my life is challenging to say the least. It’s full of rushing, managing, planning, and adjusting. Despite these difficulties I can’t remember a time I’ve been happier. Rhodes and Laurel are amazing and I’m so blessed to call them mine. What differences have you seen raising singleton toddlers vs. multiple toddlers? Is it totally messed up that this makes me want to come over and spend the morning with you? This was AWESOME! I was laughing through the whole thing! It is SO true. i swear the toddler age with twins was the hardest for all of these reasons. And I am also realizing now that I am way more lax with naps with my singleton than I ever was with my twins, but for the same reason you said. Thank you for sharing. And God bless you to get through toddlerhood with your sanity. My firstborn singleton was never like this though. She was so calm and reasonable (except on a 14hr plane ride). I’m sure this is due somewhat to personality differences, but it’s got to also be related to the fact that she had the undivided attention the twins don’t ever get. Oh my goodness. I have a 4.5 yr old daughter and two 15mths sons. They have just started walking and its getting harder and harder………….! I cannot make a dinner, unload the dishwasher, hang out the clothes, put anything away without it coming straight back out. I cannot hoover without one of the boys pulling the plug out.What next! It is great fun thou seeing what they all get upto together! Good grief, a heck of a way to start your day. I’m not sure I’d survive doing that every morning. Well done you! Wow that sounds like quite a morning! I love how you are so positive about the challenges though as well as being honest about them. I agree that a confined safe space is brilliant – we have a stairgate on our living room door and it means the children can play safely while I get to cook dinner without having them under my feet in the kitchen. Twins really do sound like twice the chaos and more importantly twice the fun and love. Brilliant post really made me smile, and made me feel tired too! My goodness you had me laughing throughout this post! Your multitasking exercising and jean stretching totally took the cake!